Lyft last night raised around $2.34 billion in its IPO, selling more shares than expected and pricing at the top of its upwardly-revised range, sparking all sorts of concerns that we're at a market peak. It's entirely possible that we're at or near the top, and that it's all downhill from here. But we don't actually know, and certainly shouldn't extrapolate from the rush of unicorn tech companies going public. The best of the past six years for VC-backed IPOs was 2012, in terms of offering proceeds, and that clearly wasn't a top. 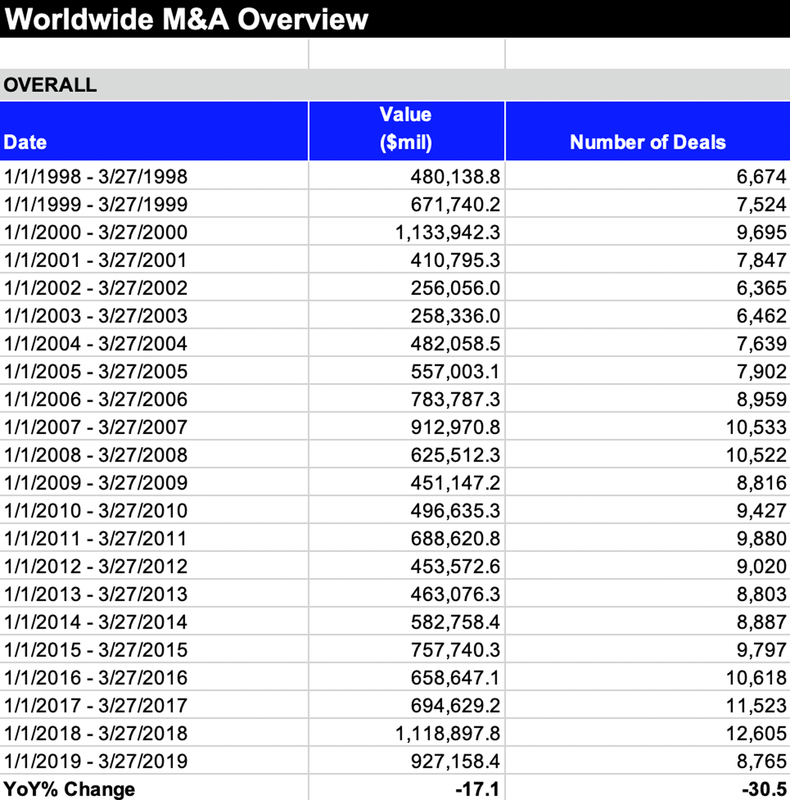 If venture capitalists and crossover investors know this is a top, why are they still investing tons of cash into high-priced, growth-stage private companies? If unicorn companies know this is a top, then shouldn't they have gone public last year, given the lockup restrictions (yes, this goes for VCs too). If banks know this is a top, then their wealth management arms are committing malpractice by pushing high-net-worth clients into these IPOs. This is the first $1 billion+ IPO on a U.S. exchange without Goldman Sachs or Morgan Stanley as an underwriter since JD.com went public in May 2014, per Renaissance Capital. The last U.S.-based issue was VMware back in August 2007, when Lehman Brothers was on the book. Renaissance Capital's Matthew Kennedy emails: "Some obvious parallels with JD going public a few months ahead of its much larger rival (both GS & MS were part of the lead syndicate for Alibaba)." Lyft reserved up to 5% of the offered shares for a program whose beneficiaries would include "drivers in good standing who have completed at least 10,000 rides on our platform." Such drivers could buy at the $72 per share price, but Lyft won't say how many drivers were eligible and/or participated. Lyft and Uber are very different companies, particularly in terms of product and geographic focus. But Uber will, at least in part, be valued by investors on the revenue multiples set by Lyft. The two big risk factors, from my perspective, are autonomous vehicles and labor regulation. AVs could obviously help Lyft increase its margins and drive down its prices, but it also would open the ride-hail market up well beyond its current duopoly. Suddenly, it and Uber would be competing both with software giants (Google, etc.) and automakers (GM, etc.). Lyft rang the Nasdaq bell in Los Angeles, where drivers have been protesting fee cuts. The more gig economy workers there are, the more national pressure there will be to guarantee them some sort of minimum wage (whether contract workers or not). These business models go further into the upside down if, for example, active drivers get $15 per hour (whether with passengers or not). Both the market cap and fully-diluted valuations are way above the $15.1 billion Lyft last received from private market investors. That's a big data point for growth equity investors who have insisted that private valuations are rational. If Lyft holds its price through the lockup period and other unicorn IPOs follow a similar path, then a lot of price critics from the past five years (sheepishly raises hand) will have to eat crow. Ascena Retail Group (NYSE: ASNA), the parent company of Ann Taylor and Lane Bryant, is considering a sale of women’s clothing chain Dressbarn, per Bloomberg. Why it's the BFD: When I was a kid, my mom and everyone else's mom shopped at Dressbarn. Apparently that's no longer true. Context: Ascena said earlier this month that its value unit, which includes both Dressbarn and Maurices, was operating at an “unacceptable level of profitability.” Last week it agreed to sell Maurices to a private equity firm for $300 million. • The Carlyle Group invested in Tokiwa, a Japanese cosmetics R&D and manufacturing company. • Huntington Solutions, a Greer, S.C.-based provider of custom-engineered molded foam solutions, acquired the assets of RADVA, a Radford, Va.-based maker of protective and temperature-sensitive foam packaging solutions. Huntington is a portfolio company of Mill Point Capital. ⛽ Omni Environmental Solutions, a portfolio company of One Equity Partners, acquired Force Environmental Solutions, an Indiana, Penn.-based provider of environmental equipment and transportation to energy producers. • Jumia, a pan-African e-commerce platform, set IPO terms to 13.5 million shares being offered at $13-$16. It would have a fully-diluted market value of $1.15 billion, were it to price in the middle, and plans trade on the NYSE (JMIA) with Morgan Stanley as lead underwriter. Major shareholders include Rocket Internet, with a 20.6% pre-IPO stake, while Mastercard Europe has agreed to invest €50 million via an investment concurrent to the IPO.